Recorded live at the WIEN MODERN festival in Vienna in 2012—the centennial year of John Cage’s birth, as it happens—In Four Parts is Patrick Pulsinger and Christian Fennesz’s reimagining of Cage’s 1950 String Quartet in Four Parts. Cage’s quartet is a generally understated work notable for its restrained dynamics, detached islands of coloristic, non-functional harmonies, and brief, fragmentary melodic motifs. The recurrence of its sets of fixed harmonies gives it a cyclical rather than a static feeling, which reflects Cage’s aesthetic interests at the time he wrote it. The quartet was the product of a period in the late 1940s when Cage, influenced by the writings and lectures of philosopher Ananda Coomaraswamy and his friendship with Gita Sarabhai, created works inspired by the codification and expression of emotion in Indian classical music. He was particularly influenced by the notion that art should reflect nature and its cyclical manner of operation—his first orchestral work was The Seasons of 1947, a ballet score for Lincoln Kirstein—and this notion is not only embodied in the quartet’s four-part structure, but forms its emotional core as well. Given this background, it was Pulsinger and Fennesz’s inspiration to re-envision rather than recreate Cage’s work. They first reduced the quartet to a duo, with Pulsinger’s analogue modular synthesizer standing in for the viola and cello, and Fennesz’s electronically treated electric guitar replacing the two violins. Their In Four Parts retains the overall structure and trajectory of Cage’s quartet, which lays out a cycle of movement that runs from more to less activity and ends with a burst of unexpectedly energetic themes. Fennesz’s guitar provides most of the harmonic/melodic material, while Pulsinger’s synthesizer frames it within a context of colors running from unpitched chirps to resonant, bell-like tones, to—in an oblique acknowledgement of the cello’s role as the quartet’s lowest voice—an occasional sub bass more felt than heard. Echoes of Cage’s harmonies occasionally arise, and like Cage’s harmonies these are configured as free standing events populating a texture of progressively thinner density. Until the fourth and final section, which like Cage’s features thicker, more quickly moving sound. Cage’s String Quartet in Four Parts is a beautiful, sublime work. Pulsinger and Fennesz’s In Four Parts is certainly worthy of it. Over the course of six evenings in spring, 1964, the San Francisco studio of radio station KPFA was the site of an exciting presentation of experimental music and proto-performance art cosponsored by KPFA and the San Francisco Tape Music Center. Initiated by composer/musician Pauline Oliveros and curated by pianist David Tudor, the aptly titled Tudorfest featured new and recent work by John Cage, Oliveros, Toshi Ichiyanagi, Alvin Lucier and George Brecht. A selection of performances from those evenings has been brought together in this historically important three-CD set. The Cage pieces included here were composed during a time when Cage was turning from chance-generated compositions to compositions employing indeterminacy as a structuring principle. Sometimes this entailed creating scores on transparencies that could be superimposed in varying combinations (Music Walk, Atlas Eclipticalis and Variations II); sometimes it meant scoring works as a series of pages to be chosen at the performer’s discretion (Concert for Piano and Orchestra); sometimes it involved allowing the performer to choose ways to prepare an instrument (34’46.776” for Two Pianos). 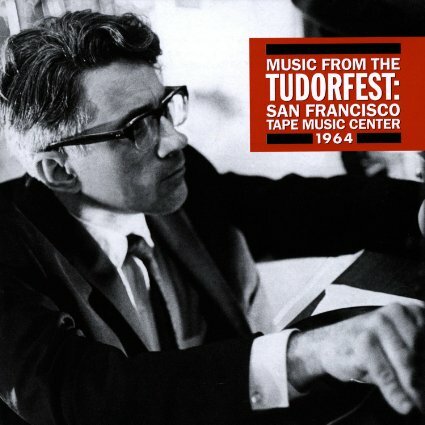 Perhaps the most notorious of these indeterminate works—notorious because of its legendary mishandling by Leonard Bernstein and the New York Philharmonic just weeks before its realization at the Tudorfest—was Atlas Eclipticalis, performed at the Tudorfest in tandem with an electronic version of Winter Music by a sixteen piece ensemble notable for including Tudor on piano, Stuart Dempster on trombone, Oliveros on tuba, Loren Rush on double bass, Morton Subotnick on clarinet, and future Mother of Invention Ian Underwood on flute and piccolo. The need for the performers to realize the work as a kind of collaboration with the composer is encoded in the orchestration; Atlas Eclipticalis (1961-1962), like the Concert for Piano and Orchestra (1957-1958), calls for each member of the ensemble to function as a soloist with a separate part. The resulting sound is a kaleidoscopic constellation of notes and noises entering and exiting individually, sometimes sounding alone and sometimes overlapping. The less conventionally scored chance work Music Walk (1957) for piano, radios and other sound makers, and Variations II (1961), for any kind of sound maker, share with Atlas an audio profile made up of discontinuous sound events spread out or clustered into an unpredictable overall texture. Cage’s 1954 time-length composition 34’46.776” for prepared piano opens the set and is in many respects the most compelling work included. The chance-composed work was originally written for Tudor and premiered at Donaueschingen; it was accompanied by 31’57.9864,” another, simpler duration work for prepared piano that Cage wrote for himself to play while Tudor played 34’46.776.” The works’ pitches were specified but the matter of which preparations to use and how to place them during the course of the performance were left up to the performers. As interpreted by Tudor and Dwight Peltzer (the latter playing 31’57.9864”), the work is a tour de force of linear klangfarbenmelodie. Given the ways the pianos were prepared, some pitches are left with their natural colors, some are muted or made to buzz or rattle, some are simply rendered into pitchless sounds. The interaction between Tudor and Peltzer allows lines to develop with a marked clarity as phrasal continuity is maintained throughout constant changes of pitched and unpitched timbres passing back and forth between the two pianists. The two Ichiyanagi compositions included in the set are two versions of Music for Piano No. 4 (1960), one electric and one acoustic. Ichiyanagi’s score consists of enigmatic verbal instructions which the performer must then translate into concrete actions. Tudor’s interpretation entailed taking objects and rubbing them against the outside of the piano. (The electronic version calls for putting contact microphones on the objects.) What Tudor elicits from the instrument is in some real sense the sound of a piano, albeit one whose strings are left untouched. In the fifty years since the Tudorfest the idea that musical performances can encompass sounds and gestures outside of traditional conventions is, if not universally accepted, at the very least admissible. This wasn’t the case in 1964, and it’s therefore significant that the critical response to the Tudorfest—to judge from Alfred Frankenstein’s review in the San Francisco Chronicle—was, in contrast to the hostile response Cage’s work found in New York the February before, sympathetic. In fact, the Bay Area seems to have been unusually open to experimentation with and between art forms as well as to contacts between the art music avant-garde and musicians working in other genres. So much so that by the time of the Trips Festival in January 1966 the local center of cultural gravity was shifting from the avant-garde to the psychedelic bands, many of whose members had attended Tape Music Center events and had been inspired by what they saw and heard. This set is a valuable artifact documenting one moment from that time of great ferment. Finding connections between John Cage and Phil Kline, experimental composers from different generations and backgrounds, is not very hard. Cage, the Zen master whose chance operations loosened the strictures of contemporary music, surely provided an early model for the random serendipities of Mr. Kline’s subsequent boombox compositions like “Unsilent Night,” a seasonal processional that wound through Greenwich Village streets just over a week ago. The performance will begin with Music of Changes Book IV: New York, December 13, a piece for solo piano by experimental composer John Cage (1912 -1992). Written in 1951, Music of Changes was Cage’s second fully indeterminate work, with compositional decisions made in consultation with the I Ching, the classic Chinese text. Performer will be Peter Henderson, assistant professor of music at Maryville University. Next on the program will be The Oracle, a new improvisatory work based on a mobile hanging from the ceiling of the E. Desmond Lee Concert Hall. Performers will be guitarist William Lenihan, director of jazz performance; percussionist Henry Claude, teacher of applied music; and cellist Tracy Andreotti. In addition, the performance will feature three dancers: Mary-Jean Cowell, associate professor and coordinator of the Dance Program; David Marchant, senior lecturer in dance; and post-doctoral fellow Ting Ting Chang. Following intermission, the program will conclude with In C, a classic 1964 work by Terry Riley (b. 1935). Often credited with launching the minimalist movement, In C consists of 53 short, simple musical phrases — lasting from one-half to 32 beats — each of which can be repeated an arbitrary number of times by any combination of musicians. Dark Side of the Black Moon / What Planet Are We On? Cage Performs Cage: Empty Words; Music for Piano; One? Zorn’s Arcana Book Vol 4! Rare John Cage Book! New London Jazz Composers Orchestra! Takase & Sclavis! Die Enttauschung, Vandermark’s Frame Qt! Fred Anderson 80th B-Day CD! Gottschalk & Fengxia! Fonda/Stevens Group! Dennis Gonzalez/Frank Lowe Qt! Allan Holdsworth/John Stevens/Danny Thompson ..and Holdsworth ‘Tony Williams‘ Tribute! Laswell’s InnerRhythmic label! MATT LAVELLE & JASON STEIN! Two Colossal Bass Clarinetists in a Rare Duet! Sunday, September 27th Double Header! 6pm – DAVE GROLLMAN/BRAD HENKEL/VALERIE KUEHNE! A Fine New Drums/Trumpet/Cello Trio! 7pm – BEN GERSTEIN & TONY MALABY! Wow! Powerful Trombone & Tenor/Soprano sax Duo! Slam Recording Artist Performs a Rare Tuesday Set at DMG! While the Evan Parker Festival at The Stone Continues! JOACHIM BADENHORST & NICO ROIG! Superb New bass clarinet & baritone guitar duo! The Fulbright College department of music will feature guest trombonist Dirk Amrein in concert at 7:30 p.m. Monday, September 14, in the newly renovated Stella Boyle Smith Concert Hall. He will be accompanied on piano by Jürg Henneberger in a recital featuring works by John Cage, Merrill Clark, Jürg Wyttenbach, Heinz Holliger and Helena Winkelman.